Inventory We are a resale marketplace, not a box office or venue. Ticket prices may exceed face value. This site is not owned by Paramount Theater Oakland . The Paramount Theater in Oakland opened in 1931 as the home of the Oakland Ballet and the Oakland East Bay Symphony. 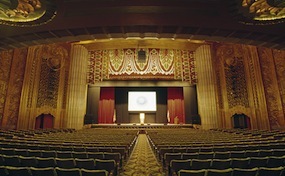 The Paramount Theatre was the largest venue in California when built and now has a seating capacity of 3,040. The Paramount Theater box office is located at 2025 Broadway in downtown Oakland, California. The most recent renovation for the venue occurred in 1973. Paramount Theatre tickets have included concerts by James Brown, Bruce Springsteen, Prince, Bob Marley, Diana Ross, Brian Wilson, and many more. The theatre also plays host to many traveling family shows and even premier movie openings. Paramount.TheaterOakland.com is a privately owned and operated company that concentrates in all events in the secondary ticket market. We are not currently associated with any official website, box office, and or primary source. Ticket prices may be well below or above face value and can fluctuate quickly with the market. To order tickets for all Paramount Theater Oakland events you have two options. Call our operators at anytime or follow the steps online through the checkout.